As usual, I was craving chocolate chip, but unfortunately there was no butter. I could have driven to the store for some, but in the spirit of using what’s on hand, I tried chocolate chip cookies made with oil. They came out of the oven looking quite pretty and they taste pretty good too! And while you may miss the butter flavor, you will get plenty of flavor from the chocolate, nuts and vanilla. I used a full teaspoon of vanilla, but you could even use a little more. Coconut might be a good addition as well. And if you want to make these somewhat more nutritious, you could use white whole wheat flour. Very good recipe, made these today. Used cherries instead of nuts. Came out crisp, short and very good, baked for 20 mins until golden as i like a crisp not a chewy cookie. I’ve made these cookies twice this week. I like that after a few days they were still moist. I added a splash of milk after all the ingredients were mixed because the ingredients were too dry. I also put it in for 12 minutes instead of 10. They are moist and yummy!!! Yes! I’ve done it before and the cookies are still great. You might want to go ahead and shape the cookies into balls, then put all the preformed balls/mounds on a sheet of plastic and wrap them tightly before putting in a freezer bag. Forming them into balls ahead of time is helpful since the dough tends to get crumbly. Can you freeze this dough the same as a butter based cookie recipe? I just discovered your chocolate chip cookie recipe and tried it all I have to say is yummy. They came out perfect just like you said crunchy on the outside and chewy in the middle just the way we like them and I also added raisins because I didn’t have any chopped walnuts but I have to confess the cookies are so full of chocolate I couldn’t taste the raisins….LOL. Mariah, thanks for the tip and review!! Glad you like the cookies. I love this recipe because I bake a lot and I run out of butter all the time. I tend to get heavier scoops of flour though so i would suggest that anyone who’s like me and scoops like that reduce the flour to 1 1/4 cups it work really well. Thanks for the recipe my boyfriend and his friends loved the cookies and it saved me a trip to the store to get butter. Also I spread my dough out across the cookies sheet and make one giant cookie and it’s best to cook it for 15-22 minutes for anyone else who likes to make them this way. I added some flax meal and honey because I didn’t have enough sugar. I have added flax meal before to chocolate chip cookies and they taste great! I will let you know how they turn out! I used this recipe to make chocolate chip pistachio cookies for my yoga studio–not only is the recipe great, but it is a great ‘base’ for lots of drop cookie add-ins with flavors that are complimented by oil. Thank-you very much for this recipe. I love this recipe for the fact that is uses only oil, which is much more healthier than butter. The cookies turned out very well and didn’t spread way out. The texture was very thick and rich. Very delicious!! I think most calorie counts people give you on the Internet are just ballparks because all cookies are different sizes. If you really want a close calorie count, put the cookie on a scale and multiply however many oz it is by 130. For cookies with lots of fat and nuts, multiply x oz by 140. For cookies that are almost pure chocolate, multiply by 140. These cookies are about 3/4 of an oz each, so .75 x 130 a bout 97 calories. Hey there, can you tell me how many calories is in one cookie? Hi! Thanks for the review! I really appreciate all the details you added, and I know what you mean about hoarding butter. It’s always nice to find a healthier and less expensive alternative. Plus, you get to skip the creaming step. I’ve made these countless times by now, and I figure it’s about time to post my appreciation. I originally found it looking for a butter-free chocolate chip cookie recipe because I hoard butter (we don’t always buy it, so I try to avoid using it when I don’t have to). It’s now my go-to cookie recipe. It’s ridiculously easy, they never fail to come out, and I consistently get rave reviews. Simply put, these are *awesome* cookies, and the lack of butter doesn’t seem to perturb anybody. I love the flavor of these myself. I make it as written except I’ve only made it with nuts maybe once (I like them, but half my family doesn’t, and I don’t need more temptation to eat them all myself…), I don’t ever use Rice Krispies in it, and I never use more than 1 cup of chocolate chips. With even 1 cup, I get chips falling out of the batter every which way; it just can’t incorporate them all. They don’t suffer, though – still veeeery chocolatey. I did once make them with all-white sugar due to running out of brown, and that worked, as did switching the ratio of brown and white (by accident xD), though my mother and sister didn’t like the flavor as much that way. In a recipe like this, I find that brown vs. white is largely a matter of taste; it doesn’t affect the way the cookie turns out that much, but most are used to the flavor of brown sugar in a chocolate chip cookie. Made them today and they were really good! I found that 1 cup of chocolate chips was plenty, I only used white sugar and I used rice bran oil. So I think that this recipe is easily adjusted. I made these yesterday and they were sooo good! My only issue was the crumbly-ness of the dough. I’m making another batch and lessening the sugar a bit since my husband thought they were too sweet. Great recipe though! Thank you for sharing. Thanks for adding your review. You just gave me an idea. I bought some mild walnut oil to use in a bread recipe and I might see how it works in these cookies. Anna, thanks for the recipe. I didn’t have enough butter and my 2 yr old loves helping me cook/bake, so needless to say he was anxious to make cookies. I found this and they turned out great. I had to bake them for 13 min and We used m&ms instead of walnuts.TASTY! Wife/Mommy also loved them as an anniversary treat! Well, I’m glad they came together! The batter is slightly crumbly, but they should spread a little. It might have had to do with the way you measured your flour. If you scooped a “heavier” scoop, you may have used more flour than I did. Also, I’ve noticed when I use bleached flour cookies don’t spread as much. Glad you were able to be creative with the results! Given your results, I’ll add a note that says to pat the balls down slightly. I needed to make cookies for a gathering of ladies from my chorus. I also was out of butter and this seemed liek a great alternative! I was a little concerned about the texture being very crumbly int he bowl , and I found myself squeezing the mixture tightly to make the balls( which never did flatten ) but in light of the fact that we just got a foot of snow yesterday … I decided to call them chocolate chip snowball cookies ! Thanks for posting recipe.. off to lalalala! Thank you Anna – good to know I’m not the only one that runs out of staples and sticks to the “use what I have” plan. 🙂 Also, good to know I’m not the only one that needs cookies when stressed! I made two slight changes – one, I reduced the oil by 2 tablespoons and added 2 T water. My thought was margarine and butter both have water in them and the water would help the dough stick together. And, I added some Cinnamon for extra flavor. Turns out I actually like the oil cookies better – mostly because they are easier to make. Plus, the oil is healthier than butter or margarine. Stumbled upon this recipe while searching recipes using oil instead of butter. I loved that the cookies didn’t run all over the pan like mine usually do. In spite of arguably being the world’s worst cookie baker, I faithfully make efforts during Christmas time for my young children. They gobbled these up gleefully! I added coconut instead of rice krispies. Thank you! Thanks for the review, Amy! I’m glad the recipe helped you make cookies when you were out of butter. Thanks for the recipe – I, too, was without butter and in desperate need of a cookie fix. This hit the spot – I didn’t miss the butter flavor too much – the texture was a bit drier than my usual recipe, but still very good. I think I might try adding some applesauce next time. Thanks, again! I googled a chocolate cookie without using butter.. this came up I tried it I like it.. I added wheat flour, coconut.. and 1 T peanut butter.. and toffee chips, I will try again.. I googled choc. chip cookies with no butter came up with this one.. very good I did add whole wheat flour and about 1 T peanut butter and coconut.. I will do this again.. I have made these twice since seeing your post, and they came out perfect both times, and everyone loves them! Super easy and yummy, thanks for giving me my now-favorite cookie recipe!! While I was showing my daughter the photos of Lizzie, she saw these cookies and had to have them. So much so, that she ended up baking them herself — A First! I posted the results on my blog. Thanks for sharing a delicious recipe! Kat, thank for the review and alterations. With enough alterations here and there, these cookies will be downright nutritious ;). Do you remember how much brown sugar you subbed for the granulated sugar? I made these today, but substituted brown rice syrup for the white sugar (and took away some of the oil.) Really chocolatey and yummy! These look great – I am photoshop challenged as well and like you the frustration kicks in after the fun wears off usually about an hour after I start. I never use butter for my Choc Chip cookies always crisco shortening – the butter flavor is good as well. Love the idea of coconut. I grew up eating this type of cookie, so when I tried the butter kind it was like an “Omigod” moment. But I still have a soft spot for oil-based cookies. Yours look yummy in the pics! I love the way you compensated for the lack of butter! 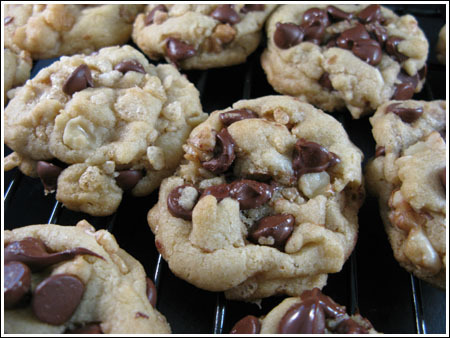 They’re so packed with chocolate chips, and it would have prefered with the rice crispies, I love them! It would have been great if it were a recipe she created or even modified, but I think Cindy is more into car racing than cookie-recipe creating and I am 99% sure she had no intention of making people believe she had created that recipe. It’s much ado about nothing. I looked up Rice Bubbles and they appear to be almost identical to Rice Krispies. I am sure they will work. Baking Blonde, I have another recipe that calls for both. I wonder if is the same as yours? I will have to send it to you. Love these. 🙂 I’ve been looking for dairy-free recipes too, so thank you. I was just wondering if you could explain Rice Krispies – we have Rice Bubbles here (Australia) which is a cereal – are they the same thing do you think? One of my all time favorites chocolate chip cookies uses both butter and oil. It’s texture is different from any other chocolate chip cookie I have ever had. Now you have me craving cookies and my thighs do NOT need that craving answered, ha ha. Tracy, yes! I forgot you were looking for dairy free! Carolyn, I’ll check it out. The problem is not so much with Photoshop but with me. It just takes me a long time to figure stuff out. About the cookies. I had one a few hours after they’d cooled. They are much better after they’ve settled. The edges get kind of crispy and even without the butter, they have lots of flavor. I made half with Rice Krispies and half without. I preferred the half WITH. Picnik isn’t a photo storage site, it’s merely for manipulating photos. I lighten up photos sometimes, crop, resize, and add the overlay text. Hi Anna. I’m new to you but I took 12 dozen cookies, some of them yours, to a party yesterday. One of the recipes I used was a ginger cookie my kids love that is made with oil. Works great. The spice flavor covers up anything lacking in the flavor of the oil and it’s perhaps a little bit less junky since I use canola oil. I’ll try these soon. Thanks for the fun. A dairy-free cookie recipe!!! Just what I’ve been looking for. Sarah, I use butter flavored shortening sometimes, but only when shortening is necessary for texture. It works very well and the flavor is fine, but shortening gives me a stomachace and I just don’t like using it anymore. I appreciate that they took out the trans-fats, but I don’t fully trust it. I’d rather use pure lard, but most grocery stores only sell the hydrogenated kind. Hendria, I may call upon you for some help. I’m putting my recipes together to make a family cookbook and I’m trying to design a nice cover. I like using on-line tutorials, but some of them make my head spin. Kid-Kat, I love Dreena’s chocolate chip cookie recipe, but today I wanted to try something a little different. Dreena’s is great and the extra flavor from the maple syrup compensates for the missing butter flavor. I need to go eat a whole cookie so I can compare this recipe to Dreena’s. The cookies look great!! By the way, I highly recommend the cookie recipe that Kid-Kat linked to. These chocolate chip cookies are vegan and low in fat, but you can’t tell. (the stories, not the recipes).